Validation of sterile manufacturing process by media fill validation test as per PICS guidelines for aseptic validation or aseptic process simulation. 1.1 To define procedures for validating and maintaining the validation of all aseptic filling processes and qualification of the quality of the product by system/facility/equipment. 2.1 This procedure applies to all aseptically filled sterile products intended for human use. 3.1 The Validation personnel coordinate the aseptic filling validation program and write the sterile media aseptic filling processes reports. 3.2 Manufacturing personnel the sterile media aseptic filling processes and performs the sterile media fills. 3.3 QA personnel perform the sampling and assist with the IPQA monitoring required for each sterile media fill. 3.4 QC personnel to perform the testing and assist with the monitoring required for each sterile media fill. 6.1.1 All Operators and Supervisors enter department as per Defined Gowning procedure. 6.2.1 The media fill run shall be performed for approximately the same duration as required for filling of a normal production batch (approx. 12 hours). 6.2.2 Batch (Media) manufacturing shall be done in the initial hours of the 1st shifts, followed by other processing steps normally followed. 6.2.3 Nitrogen flushing shall not to be done during media filling. 6.2.4.1 The media (Soybean Casien Digest Madium) batch shall be manufactured in the manufacturing area. The bulk is then aseptically filtered into a sterile holding tank (under LAF) in the sterile area. The tank containing the filtered solution is then connected sterile silicon pipeline and filling done in ampule without employing the use of on-line cartridge filters/filter housing on the machine. 6.2.4.3 Filling activity is performed in the filling room (especially the filling zone) under LAF. 6.2.4.4 Consecutive first three runs will be validated with sterile media solution. 6.2.4.5 Simulate the adverse condition testing of the system (details of adverse conditions given separately in step 6.4) after filling approximately 10,000 units. 6.2.4.6 Filling to be planned in a manner such that the operator covers the activities during the shift change over. 6.3.1 The media fill run shall be performed for approximately the same duration as required for filling of a normal production batch (approx. 12 hours). 6.3.2 Batch (media) manufacturing shall be done in the initial hours of the 1st shifts, followed by other processing steps normally followed. 6.3.3 Nitrogen flushing shall not be done during media filling. 6.3.4.1 The media (Soybean Casien Digest Madium) batch is manufactured in the manufacturing area. The bulk is then aseptically filtered into a sterile holding tank (under LAF) in the sterile area. 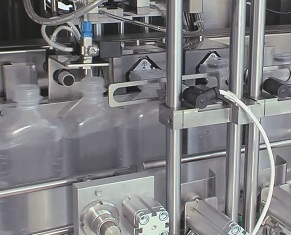 The tank containing the filtered solution is then connected with is sterile silicon pipeline and filling done in vials without employing the use of on-line cartridge filters/filter housing on the machine and then dosing of sterile lactose in vials. 6.3.4.2 Transfer the sterile lactose through material airlock into the sterile area and transfer the sterile lactose aseptically into the previously sterilized hopper of the vial filling machine. Three runs will be validated with 250 mg sterile lactose and 5 ml media solution, 500 mg sterile lactose with 5 ml media solution and 1000 mg sterile lactose with 10 ml media solution to validate the weight range from 250 mg to 1000 mg.
6.3.5 Filling activity is performed in the filling room (especially the filling zone) under LAF. 6.3.6 Simulate the adverse condition testing of the system (details of adverse conditions given separately in step 6.4) after filling approximately 10,000 units. 6.3.7 Filling to be planned in a manner such that the operator covers the activities during the shift change over. 6.4.3 Air Handling Units power OFF: For 5 minutes (ALL the AHU’s of the sterile and the adjoining areas to be switched OFF, filling to be done when AHU’s are OFF). 6.4.7 Ampule/Vial Sterilizing tunnel OFF: For 5 minutes (total power supply of the tunnel is to be switched OFF, after restarting tunnel all the units from the cooling zone to be filled). 6.5.1 Collect all units in a tray or suitable container, Store in previously maintained temperature defined area or incubator. 6.5.2 First Store at temperature 20 -25 ° C for seven days. 6.5.3 After that Store at temperature 30 -35 ° C for seven days. 1. After the incubation period of the media-filled containers, they are visually examined for microbial growth. Contaminated containers should be examined for evidence of container/closure damage which might compromise the integrity of the packaging system. Damaged containers should not be included as failures (positives) when evaluating results. • When filling fewer than 5000 units, no contaminated units should be detected. b) Two (2) contaminated units are considered cause for revalidation, following an investigation. Abstracted from: PIC 007-5 dated 01 July 2009 Recommendation on the Validation of aseptic processes. 6.7.1 After 14 days media shall be destructed as per sop or procedure. 6.8.1 Initial Three consecutive Successful Run(all container size employed for filling on the machine) before start production for qualified area or equipment. 6.8.2 Then after once in 6+1 month of Single run any suitable volume for re-qualification of area or equipment. 6.8.3 If any change or modification of critical equipment or area then goes for single run media for any suitable volume before starting production. 6.8.4 If critical equipment or area is not in use for about one month then go for single run media for any suitable volume before starting production. 6.8.5 As and when required. Dear Sir, please tell why a concentration of 3% SCDM is used in media fill? 3% CDMA is sufficient to support the microbial growth. Dear sir, please explain why sterile lactose is filled in the vials during medial fill.